Tekkon Kinkreet was originally published as a Japanese manga in 1993. The title is a pun on "Tekkin" and "Concrete", the Japanese term for reinforced concrete. 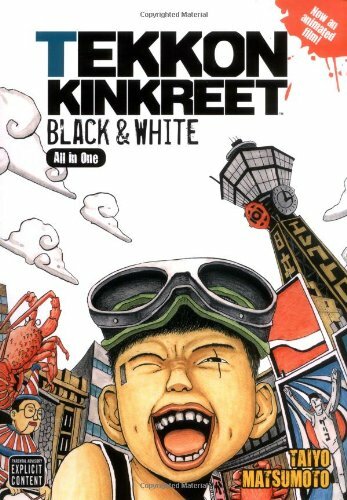 Just four years before creating Tekkon Kinkreet, Taiyo Matsumoto had traveled to France for artistic research. The style of art in this book was heavily the French comics he studied there. It's a mixture of French line art with Japanese manga paneling. The story is about two orphans, Black and White, who live in the fictional Treasure Town as they take on the yakuzas trying to take over the city. They are street kids, known as the Cats. Black is violent and sees it his responsibility to take care of his seemingly innocent brother White. Oh, and these boys can fly, literally. Just as the names of the kids suggest, this theme is on the light and darkness. It's about how the kids relationship with people around them, having to find the way in their own lives on the streets, most oftentimes ending with violence. It is a gritty tale about friendship and change. There are no heroes in this book. I actually bought the book after viewing the Blu-ray version of the anime. The adaptation is quite faithful. In fact, I was underwhelmed by the comic since the anime featured some pretty spectacular background paintings. The manga is a distilled version of that in terms of art and style. You should read the book first before watching the anime. The story is simple, really, narrative absorbing. Overall recommended.